The problem with most novelty gamer socks is quality. They're for fun and just like all novelty things, they're cheaply made and not as good as the 'non-novelty' version. You see, we're gamers too and like you, we want our gaming accessories to be long lasting, be ultra comfy and look amazing! 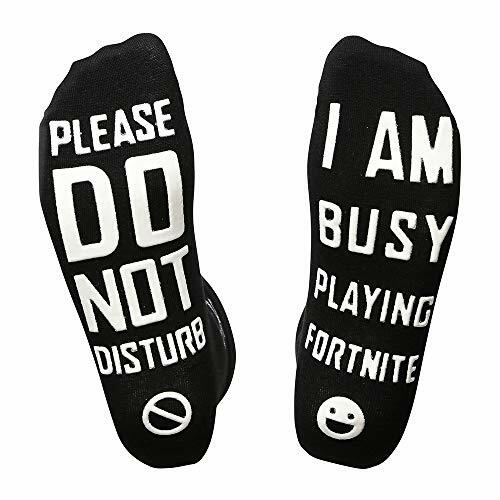 So, if you're looking for gaming socks for you, or a gift idea for your husband, son, dad, brother, best friend, boyfriend, mum, sister, daughter - Christmas, Birthday or Fathers Day...... you're right on time and in the right place! Available in Black, so you can avoid washing them! Gamer Tagline around the band: Eat, Sleep, Play! With Six styles to choose from, why not have a browse and then select the socks that suit you best. And as soon as your new socks arrive, try them on and if they don't fit, you have 30-Days to return for a refund - remember they're a UK 4-10 and ultra-comfy! DO NOT DISTURB... I Am Busy Gaming! We interrupt your game to bring you our unique collection of creative Gamer Socks designed by Gamer! If you are looking to treat that special someone in your life with novelty gifts, or cool gaming presents that loves playing video games then look no further they will love these. Each pair of black crew socks has a bright colourful rubber-grip printed message on the sole, and embroidered band on the top section that reads EAT, SLEEP, PLAY! SUPER COMFY: Our Gamer socks are far superior in quality and style compared to other similar items available on the market. They look like crazy socks, but perform like sensible cotton socks with style, we use a soft blend of 65% cotton, 32% Polyester and 5% Elastane to ensure each and every sock provides a perfect fit for men, women, boys and girls with high breathability and most importantly comfort as we understand that when you're settling in for a few hours, comfort is king! LONGER THAN OTHER SOCKS! We know size can be a concern - Gamer socks (by Gamer!) are a UK 4-10 - and one size fits most unisex design. We know Gamers don't wear ankle cut socks but oddly, the majority of other gaming socks are exactly that! Our socks are calf length socks - these are the right length for any indoor gamer. Our unique branding and retail quality packaging will ensure these novelty dress socks are the perfect gift for your loved one. THE PERFECT GIFT! Coming up with an inspirational gift can be really tough, well the great news is your hunt ends here with our Do Not Disturb Socks and they are under 10 pounds with our Do Not Disturb range. So if you are looking for ideas for Christmas Presents / Birthday Presents / Anniversary Presents / Secret Santa / Party Bag Fillers / Housewarming Gift or for your Husband, Wife, Son, Daughter, Grandchildren or you could even buy a pair for yourself, as we all deserve a treat don't we?